Winter Magic; Predator hunting EAST and WEST! There's a magic that comes over you when a predator comes at you across a sea of white. It makes your heart pound, your blood pressure rise, and there's a flutter in your stomach. We know the feeling well, and it's why we chose "Winter Magic" as the title for this video. Predator Hunters: Winter Magic captures 22 exciting hunts for coyotes and red fox using both calling and spot & stalk sniping techniques. Join hosts John Summerfield and Pat Cameron as they unlock the secrets of successful eastern predator hunting in 11 hunts in the frozen mixed farmland & woodlands of the East, and thrill you with 11 classic hunts in the snowbound terrain west of the Mississippi. In addition, there is a separate tips & techniques section featuring valuable insights for hunting predators on both sides of the continent. Regardless of where you live and hunt predators, this video's variety of locations, species and hunting techniques is sure to satisfy. DVD (NTSC). Total running time: 107 minutes. Come along as the Predator Obsession team travels across Oklahoma and Texas hunting some very diverse terrain. Learn tips on scouting, setup, use of decoys for calling bobcats and coyotes. Tips on hunting in tight cover where the action is fast and in your face. How to properly skin a coyote once you put them on the ground. 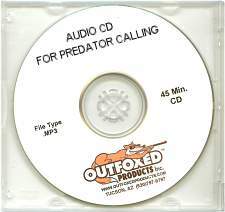 All predators called using Wildlife Technologies electronic caller. 30 coyote hunts, 8 bobcat hunts, also hog, javelina, and prairie dog hunting. Compare GameCalls.net's price to our competitors who are charging $19.95 for this DVD! Contains 37 Breathtaking Predator Hunts!! Experience the RUSH as you join Todd Woodall and Jeff Thomason on 37 adventurous hunting trips across Texas and Arizona. With their tips on day and night hunting, coyote behavior and product selection, you are sure to learn techniques that will make you more successful. Laugh along with the guys when things go "south" and watch their record-breaking hit-and-miss encounter with one lucky coyote. If you like fast action and good clean fun this video is for you. Run time is approximately 1 hour and 45 minutes. Get behind the cow decoy and join Les Johnson and friends as they jump shoot snows and blues in the cornfields of central Nebraska. You’ll be amazed at the sheer mass of birds that blot out the sky when the shooting begins. It’s hard to fathom the devastating impact upon delicate nesting grounds in the Arctic, until you see tens of thousands of geese dropping from the sky to feed along their northern migration route. Johnson teaches the technique that makes it look easy, because it is. Get in on the fun and action, and you’ll never let another snow goose season go by! Watch as a total of 7 attempts result in over 300 birds being taken! Predator Quest Coyote Calling preview included! If you like bowhunting (and you probably do if you are reading this), then this is the pack for you. This pack has everything a bowhunter needs. A video to get you fired up about going, calls to bring in the bucks, and a wind checker to let you know where to set-up. Learn to Master the Art® of Deer Hunting. There is so much to learn about deer hunting that it can't be covered in one video. We narrowed our focus to hone in on the things that have proven to be the most significant in upping the odds for success. You'll learn tactics on Team Primos'® most powerful tool - how to call deer up close. We teach by example, as we lay out for you what we are doing on each hunt. This video has foundation skills for beginners and new techniques for veteran hunters. Learn to Master The Art® of calling in deer. There is so much to learn about deer hunting that it can't be covered in one video. You'll learn tactics from Team Primos® on how to call deer up close. We teach people by example, as we lay out for you what we are doing on each hunt. This video has fundamental skills for beginners and new techniques for veteran hunters. One thing all whitetail hunter's share is the anticipation of each hunting season. The plotting and planning around the moon phases, the rut, or just the enjoyment of being in camp; these are the elements of the hunt we all enjoy. On this DVD, you will see the good, and let's not say the bad, but the misses or mess ups that we try to keep our buddies from finding out about. Join the Primos® Team as we bring you whitetail hunting in its true form. This ain't Hollywood, It's THE TRUTH®! DVD video format. Guaranteed not to freeze or stick under any hunting condition.